Just in case you missed the news, “Insider trading” is back. It’s even bipartisan. Well, the truth is that it never really went away after its heyday during the 1980s, when Gordon Gekko served as a stand-in for era villains like Michael Milken and Ivan Boesky. It launched more investigations in the 1990s than at any other time, except for the 1980s. Not only are insider trading and inside traders back, but they’re not just on Wall Street anymore. They’re all over Capitol Hill, and apparently have been for a while. Naturally, now that it’s news, there’s a bill to ban congressional insider trading —the Stop Trading On Congressional Knowledge Act, a/k/a the STOCK Act. Naturally, this has led to efforts to block the STOCK Act in the House of course, after the Senate passed it by a vote of 93 to 2. That lawmakers have to go out of their way to pass a law prohibiting them from engaging in insider trading with information they come by as a result of being lawmakers, is revealing. But the hoo-rah over the STOCK Act misses another related, and perhaps even bigger, problem. It fell to Jack Abramoff, of all people, to point this out in an appearance before Public Citizen. A word to the American League of Lobbyists — we have a saying down south that might apply here: “A hit dog will holler.’ To put it another way, going out of your way to say “He’s not talking about us. That’s not what we do,” pretty much confirms that he is talking about you and that what he’s talking about is what you do. 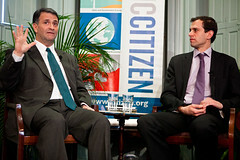 Abramoff, if nothing else, probably knows whereof he speaks. His remarks fill in another part of the bigger picture (of which Citizens United is another part) of government of, by and for the 1%.